A few weeks ago I had the opportunity to go to a meeting of the Presbytery of Northern Baja California, Mexico. I was there in my photographic capacity, rather than as my pastoral self, but as I met the Mexican pastors I was introduced as both a photographer and also a pastor. The men (they were all men as the Presbyterian Church of Mexico does not ordain women as pastors, though they are set to vote on the issue at their upcoming General Assembly) were friendly, welcoming, and pleasantly surprised by the fact that though I look like a guera I actually do speak some Spanish. I had met many of them earlier in the week as I went around to the various churches of the Northern Baja Presbytery, in Tijuana and Tecate, photographing the buildings as well as the pastors and their families. So, it was more than a little bit awkward when Rachel (my host, a local PCUSA mission coworker also ordained as a minister in the PCUSA, and clearly, by her name, also a woman) and I realized that the first item on the morning’s agenda was an American (and also a male pastor/missionary to the area whose Spanish was, as far as I could tell, fluent) speaker from the PCA (Presbyterian Church in America) presenting a case against the ordination of women. As the speaker was being introduced he corrected his host and clarified that he was not presenting ‘a case against women’s ordination’ but rather ‘the Biblical case regarding the ordination of women. Unfortunately my Spanish is good enough that I caught pretty much all of the presentation, about how the speaker did not hate women–“I love my wife and my daughters”–but that he was simply trying to obey the Bible, which “clearly states that there are different roles for men and for women” and that was all he was asking of the men gathered. To love women, to treat them well, and to remember that they occupy a certain complementary (a word he used to contrast with ‘equal’) role to play–but to, above all else, honor and submit oneself to the authority of Scripture which clearly (though this ‘clear’ case was not really laid out) tells us that women should not be pastors. There was more. His presentation went on for nearly an hour. But what struck me almost immediately and stayed with me throughout the duration of his presentation was how much it reminded me of something I had heard recently in my own presbytery, only there it was the ‘Biblical case against the ordination of homosexuals’ rather than the ‘Biblical case against the ordination of women.’ As I sat in that Baja church (called “Dios es Amor” or “God is Love”) listening, I couldn’t help but feel that I was in some sort of odd time/space warp between their presbytery meeting and my own recent presbytery meeting. During that February gathering in Los Ranchos, Richard Mouw, who has had a key role as a reconciler between ‘conservative’ and ‘liberal’ in the ongoing debate/conversation regarding homosexuality, similarly made the point that he was not against homosexuals–“I love homosexuals”–but that, at the end of the day, he had to be true to Scripture which makes the clear case against the ordination of homosexuals. He spoke of his desire not to put down gay people or to hate them, but the greater conviction to uphold the authority of the Scripture. It was almost apologetic, in the “I’m sorry” kind of way, as in “I’m really sorry I have to believe this, but I just can’t do anything else and be true to who I am, who God is, and who God calls me to be.” He was very gentle in his presentation. So gentle and humble in his presentation, in fact, that one was almost tempted to wonder if even those with whom he disagreed might actually somehow be won over to his ‘side’–an assumption that was debunked after talking with a handful of the more ‘liberal’ members of the presbytery. But sitting in that Baja church, listening, in Spanish, to an hour long presentation of why I, as a woman, was unworthy to be called by God as a minister, what I was struck by, in addition to how similar these arguments seemed to those used regarding ordination of homosexuals, was how painful it was to be the subject and focus of that argument being discussed around me. I didn’t have to justify my case, or actually even think through how I might do so, as I have the benefit of others having paved that way before me–the PCUSA has been ordaining women as ministers since, if my memory of Presbyterian history serves me, 1964. When I felt called by God to enter the process of discernment for ministry, it was my sense of God’s call that was questioned, not my gender. I took it for granted that I could be ordained, provided that my sense of God’s call (that had been nurtured in me by the evangelical church of my youth), was confirmed in community and through the process. So, though one might assume, being a woman minister, that I had already worked through these ‘Biblical arguments against the ordination of women,’ to sit there and listen to them delivered was surprisingly painful and somewhat foreign. As the presentation regarding the ‘Biblical case regarding the ordination of women’ came to a close and the meeting adjourned to a break, I stepped outside the church for a breath of fresh air, probably metaphorically as well as literally. The church building for “Dios es Amor” is on the corner of intersecting pot-holed dirt roads in eastern Tijuana, a city burdened by the ramifications of media reports about its drug problems, violence and crime. As I looked around I wondered about the many challenges facing the church in Mexico–and I wondered about their current debate over women’s ordination. I wondered what Jesus would see, walking down the road past Dios es Amor? The other side is so close, but yet so far. Driving home from the meeting that day, though many hours after the morning’s presentation, I couldn’t shake the sense of both discomfort and frustration, but also the irony of the context in which the debate was being waged. But overwhelmingly I felt a sense of sadness for those who have had to sit through such debates about their own worthiness for much longer than an hour. The morning’s debate really had nothing directly to do with me, and yet it was still painful and uncomfortable to be, in a sense, its focus. 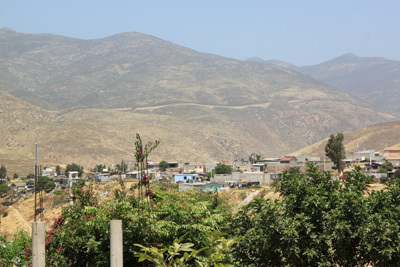 As I was driving through the hills of northern Baja, along the Blvd 2000, I picked up my phone (while using my headset, of course) and called a gay minister friend of mine, apologizing to her for not really ever realizing how much she had to sit through as other people discussed whether or not God might call someone like her. What an honor it was to be able to have so many friends and family join me for my ordination service on Sunday, October 18! After ‘languishing in the process’ (well, not actually, but having been ‘threatened’ with the category…) for the past six and a half years, believe it or not, I am finally going to be ordained! Details are still TBD, but consider yourselves invited October 18 to a late afternoon service, followed by a reception/party. For those of you from out of town, there are plenty of folks with whom you can stay if you’d like to make the trip–you are invited!